If it makes Washington's November election ballot, Initiative 1639 would raise the purchase age to 21 for those buying semi-automatic weapons, among other things. Backers plan to turn in thousands of signatures this week. OLYMPIA — A Washington Supreme Court commissioner wasted no time Tuesday in rejecting an attempt by gun-rights supporters to keep a firearms-regulation initiative from going to voters in November. Initiative 1639 would, among other things, raise the purchase age to 21 for those buying semi-automatic weapons and require enhanced background checks, training and waiting periods in order to obtain them. The Washington Alliance for Gun Responsibility is scheduled to turn in about 360,000 signatures later this week. Initiative supporters must turn in the valid signatures of least 259,622 registered voters signatures by Friday to place the measure on the general election ballot. 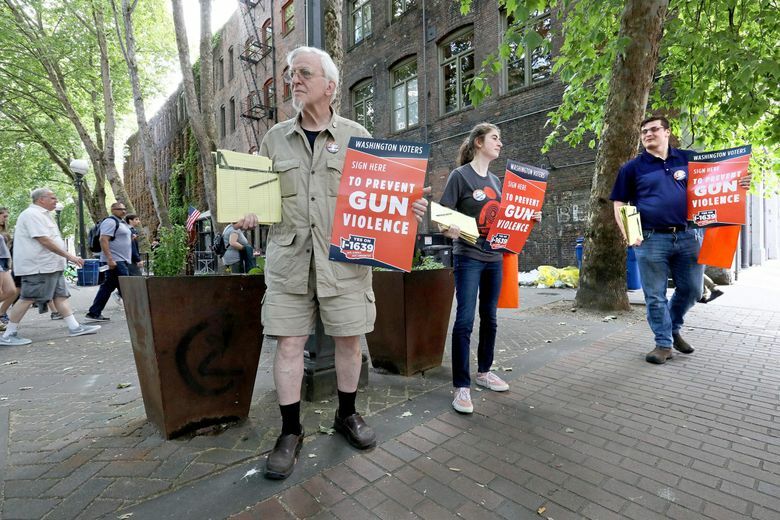 The Bellevue-based Second Amendment Foundation and other parties on Friday filed a request for an injunction with the Washington Supreme Court. They claimed that I-1639’s signature petitions do not show all the changes the initiative would make to state gun laws. Naming Secretary of State Kim Wyman as a respondent, they asked the court to invalidate the petitions. But Supreme Court Commissioner Michael E. Johnston dismissed the filing. Among other reasons, Johnston wrote that judicial review of initiatives in these instances can occur only when the Washington secretary of state has declined to place a measure on the ballot. The denial isn’t likely to stop the Second Amendment Foundation’s efforts. “We are filing a motion to reconsider as I write this,” Alan Gottlieb, executive vice president and founder of the group, wrote in an email. Washington voters in 2014 and 2016 widely voted to approve gun-safety measures, including one expanding background checks for those purchasing firearms. It remains to be seen whether groups like the Second Amendment Foundation or the National Rifle Association will put up big money for a formal opposition campaign. Microsoft co-founder Paul Allen and venture capitalist Nick Hanauer, along with his wife, have each given more than $1.2 million to the initiative campaign. As of Tuesday, the Alliance for Gun Responsibility had raised $3 million to support the initiative.